How well does a player have to shoot to be a good shooter from beyond the arc? Welcome back to Corner Stats! Today I made a real numerical analysis, trying to understand how well a player should shoot from beyond the arc to reach the same quality than other shots. Here we go! This analysis is born after having seen a tweet that talked about the growth of the threshold percentage to define if a shot from beyond the arc is good or bad. Another interesting point of the analysis reported in the tweet is to account for free throws, a conclusion that guarantees a good amount of high percentage points. Considering these two factors, the threshold 3-point percentage in recent years has increased to the current 37% (in the NBA). 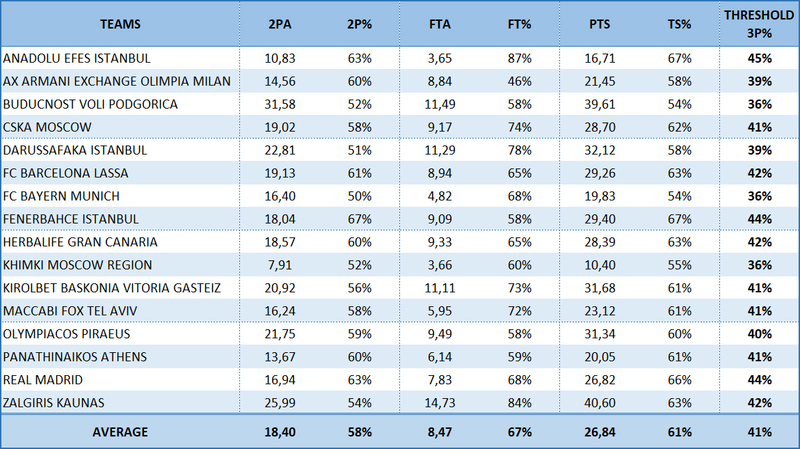 So, I wanted to carry out this analysis also for the EuroLeague, but taking another step: I did not just want to find the global threshold percentage, but rather figure out the minimum percentage from 3-point range in order to reach the same efficiency of the 2-point shots and FT made by players that do not take shots from the arc. Initially, I had thought to compare big men and guards, but now it is more convenient to divide players into shooters and not. Let’s start by calculating the threshold percentage for each team: I have considered all the players with at least 10 minutes of average use and less than a 3-point shot attempted per game. You find in the first double column the sum and the percentage of the 3P shots taken by all the players with at least one attempt per game from the arc. In the second group you find the same values, but in this case, I added only the shooters’conclusions (those players who take less than two shots from 2 points and more than two from three). In other words, in the first column you find the sum of the triples attempted by Micov, James, Bertans, and all the other Olimpia’s players with at least one triple per game, while in the second you find only Bertans’attempted shots, because he is the only player to achieve the requirements to fall in shooter case. Gran Canaria, Baskonia and Panathinaikos do not have players for this category and therefore do not have data for the second comparison. I highlighted the percentages above the threshold in green, those under a 3% difference in orange, and those above a 3% difference in red. 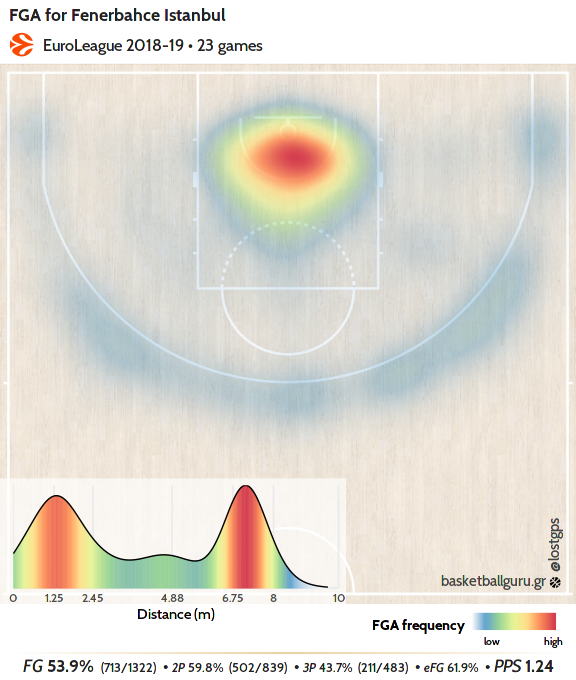 As you can see, half of the teams can not guarantee the same efficiency of the shots taken inside the arc; we had already underlined how some percentages were really high and therefore tough to match. 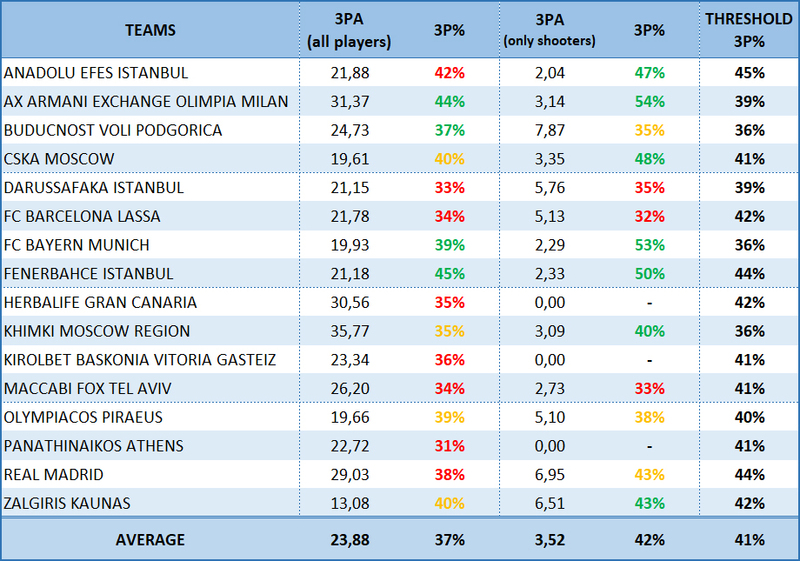 Observing only the shooters’columns we have only six teams below the threshold percentage: the shooting quality of EuroLeague’s players is very high. It’s important to say that there is a correlation between these data before concluding: the very good percentages from 2 points in some cases are influenced by the presence of one or more shooters on the perimeter. This is because the defense, worried by them, opens more spaces in the area and/or delays defensive help, thus allowing greater freedom to big men near the iron. The Fener is a team with very high-level players, but I am sure that the shooters’and Vesely’s presence helps at the same time the two types of player to take easy shots. 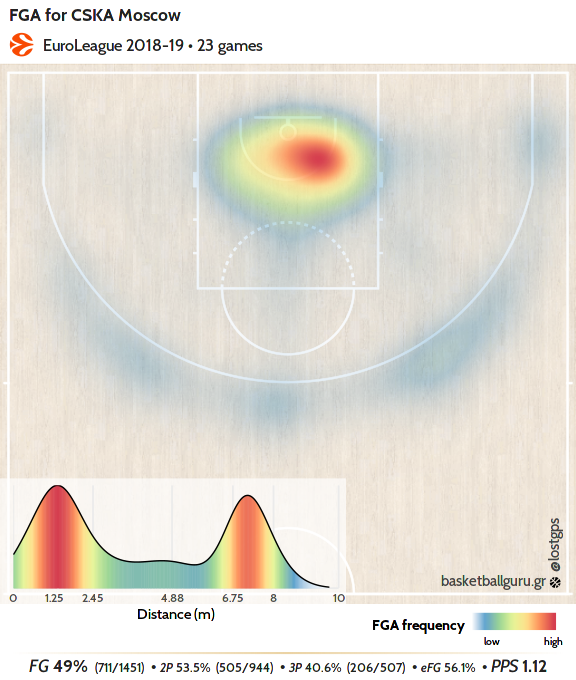 In conclusion, with this analysis it is possible to understand how a team should shoot well from 3-point range to equalize the quality of its players near the rim, also considering their contribution from the free throws. With this data, it is possible to make some defensive choices that can significantly influence the progress of a match. For example with Maccabi, it is preferable to leave a triple rather than a shot in the area because, observing its percentages, the 3P shots attempted by Tel Aviv guarantee a much lower efficiency compared to the other shots. A similar conclusion can be done for the Panathinaikos. It is, however, a choice that must be evaluated during the match. In any case, you can easily understand with the threshold percentage how the 3-point shot is now a very valuable conclusion, but also that the threshold to determine the goodness of the same has risen because of the evolution of the play style.